Sorry for the complete lack of posting this week. My girl woke up sick last Saturday morning and turns out it's pneumonia. She's been miserable all week despite starting antibiotics on Monday. The pediatrician gave her an antibiotic shot yesterday and she goes in for a second shot today. She slept through the night last night for the first time in a week. So the shot seems to be helping! I sometimes opt for natural methods of treating illness, but we all decided we weren't going to mess around with pneumonia, especially now that she's got asthma, too. Could be a lot worse, we didn't need to see the inside of a hospital! So, she appears to be on the upswing and my head is spinning with crafty ideas. I will follow through on my promise about posting organizing tips and tips on paring down your stuff. Hopefully I can get in some crafting and blogging this weekend! Not much craftin' goin' on 'round here. We're having a garage sale tomorrow. We have 18 trash bags full of clothes in our garage - don't worry, I've set aside all our old T-shirst and denim and khaki pants and any other items that can easily be transformed or sewn into an adorable outfit for my girl! ), several boxes of housewares, a couple of boxes of books, movies and CDs, a loveseat, some baby gear, a ton of candles (from my former life as a candle addict and dealer) and a bunch of other odds n' ends. Oh, and a very small box of craft supplies. Times are tough and money is very tight, but come on, I'm not selling many of my beloved craft supplies. I'm not crazy! In all seriousness, we have been hit hard by the recession and economic challenges of the last year so we really need tomorrow's sale to be lucrative. Please send us prayers, well wishes, good thoughts, keep your fingers crossed and wish us luck that our garage sale is a success. Once I've recovered from it, I'll be posting about ways to organize and pare down your stuff! It's amazing how great we feel knowing that we'll be getting rid of so much stuff that's been piling up in our garage! We've been married for 10 yrs and we've never had a garage sale, so we have a LOT of stuff! Are you a yard sale go-er? (I don't know what the term is for people who frequent yard sales?) Have you ever had a garage sale? This is a super simple activity to keep little hands busy while helping stretch their growing minds! Set up: Adult writes the alphabet A-Z on sheet of cardstock or paper. This can be done in uppercase to match the letter stickers as I have done, or you could write the lowercase letter and have the child match the uppercase letter sticker to the lowercase letter on the paper. To make this a portable activity, place 1 of each letter sticker in a zippered plastic bag and staple to the paper. To do the activity, the child simply chooses a letter from the bag and then matches it with the corresponding letter on the paper. Doesn't get much simpler than that! My 3 1/2 yr old loves stickers and is loving learning her alphabet. She stayed busy with this activity for quite some time! As I was pondering how to fix it or if it would fit Taylor's doll, I turned it upside down and decided the too small hat was the perfect sized basket for sewing notions! Of course, within minutes of seeing it filled with goodies, Taylor said "Hey, that's my hat!" and promptly dumped the goodies and reclaimed her hat. When I told it was too small, she simply said "No it's not." and walked away. I've casted on another hat and I'll reclaim my notions basket when I'm able to trade it for a better fitting hat. Negotiating with preschoolers...it's an acquired skill. It's Lion Brand Homespun. I'm making a wrap with it. You can find the free pattern, here. I love the soft, buttery feel of the yarn in my fingers as I'm knitting and I love the color. My winter wardrobe is full of black and brown and this color looks good with both of those colors. Also looks fab with denim. What yarn do you love? I'm so happy to announce that my paper bag pumpkin craft is featured today over at The Crafty Crow! I love The Crafty Crow and get sooo much inspiration from the amazing projects featured there. Thanks for collecting all the kids' crafts, Cassi! I hope my paper bag pumpkin inspires others to get crafty, too! If you're visiting me today because you found me through The Crafty Crow, thanks for stopping by! Taylor is all about fashion, right now. And, she is all about dresses and polka-dots. Polka-dot dresses are the ultimate high for her! The weather has finally cooled down but she's still insisting on wearing dresses. She doesn't have many fall dresses, so today I went on a mission to Target. I bought (well, actually Grammie paid for - - Thanks, Mom!) a few long sleeve white T-shirts that she can wear under her summer dresses. But of course, I had to look at the fall dresses. I came across this adorable brown sweater dress that was already on clearance. My brown-eyed girl looks beautiful in brown, so of course I had to scoop it up. Then, I went searching for tights...I got these polka-dot ones and an absolutely adorable pair of flowered ones. I also picked up the cute mary-jane shoes and some adorable brown boots. (She's on a trend of wearing pretty dresses with hiking boots...Daddy thinks it's cute, I prefer more girly boots with dresses). And...these pants, are currently cut up into pieces on my cutting table (oh, wait, it's actually a dining table?) so stay tuned to see what I make with them! The hat looks cute in the pic up top, right? I altered the pattern a little, I used smaller needles and a thinner yarn (sportweight rather than worsted weight that the pattern calls for) and, I measured Taylor's head from crown to brow. The finished hat from crown to brow is eight inches when the pattern is followed as it's written. Taylor's head is 5 inches from crown to brow, so I figured her hat should be 5 inches when finished. It is, indeed 5 inches, but it is clearly too small. Is there any way I can salvage this without starting all over again? As I said, I'm really loving knitting the hats and knitting in general, but I like it better when my project turns out the way it's supposed to. So, anyone have any advice on how to fix the hat? I cleaned out the fridge earlier this week and when I gathered these veggies that were well beyond their prime, I remembered a Toddler Art Party that my mom's group did when our kids were around 18 mos old. The host of the party set up a free painting area and had all kinds of veggies for the kids to paint with. I decided to do this again with Taylor. She loved it! Basically, I just covered 2 cookie sheets with foil, laid out the cut fruits and veggies on one of the cookie sheets and put puddles of paint on the other cookie sheet. As always, we used our muffin tin to mix our paint colors. 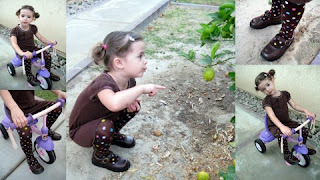 Then Taylor chose her fruits/veggies and dipped them in the puddle of paint, then stamped then onto the paper. By the end of her art session she was using the veggies as "brushes" and dragging them in various ways on her paper. This was such a simple and fun craft to do with my 3 yr old and would be a great craft for kids of all ages. Here's how we created these adorable fall decorations. - Paper bags (2 bags for each pumpkin) - I used lunch bags but you could make large pumpkins with paper grocery bags. - Green cardstock (I used 1 sheet of 12x12) you could also use green paint instead. Open a paper bag and insert a second paper bag into the first one so you bags are now doubled up. This makes them more durable and if one bag tears it won't show. Fill paper bag about 1/2 - 2/3 full with newspaper. Press the newspaper down as you go, so that your pumpkin will be "full". Gather the top of the bag and wrap a rubber band around the top several times, to create the stem of your pumpkin. Now wrap another rubber band around the top 1 time, then pull the rubber band down around the bottom of the bag as shown. Optional: Continue doing this with 4 more rubber bands and arrange them somewhat evenly around the bag to create the ridges of the pumpkin. I like this step because it gives the pumpkins a more realistic shape and look when finished. Paint the base of the bag orange. Leave the pumpkins to dry overnight. Once dry, cut the stem of your pumpkin to the desired length. Tear a strip of green cardstock and wrap it around the stem of the pumpkin. Glue the end of the paper to the stem. Then tear or cut out a leaf shape and glue it to the stem. If you are using green paint, you would paint the stem green. Proudly display your new fall decorations! This was the perfect way to start our weekend! Taylor had her first gymnastics class yesterday morning. We enrolled her at a local community center in the same class as her BFF. As I've mentioned before, my girl is constantly on the go, high energy and absolutely loves when Daddy flips her in the air and throws her up in the sky. She started doing somersaults around 18 months and even in the womb the girl loved doing backflips. So, of course, gymnastics seemed like the natural choice for her first "extracurricular activity". I also spent several years in gymnastics as a kid and loved every minute of it, so I'm more than happy to share this love with my favorite girl. There are 6 girls in the class, it's an hr long, every Saturday morning. I thought they would do floor exercises (somersaults and other movement) but they used the bars, the balance beam and a floor track (I think I've got the name of that right!). The floor track is like a long straight trampoline that the kids ran down, jumped down and bounced on. I would have liked to try it! They didn't have that at the YMCA, when I was a kid! Anyway, she loved every minute of the class, and often ran over to us after conquering a new challenge and shouted "I DID IT!" with an overwhelming sense of pride. We're all so excited to go back next week!